Daniel stands for this: that no one could change his ‘name.’ Daniel remained who he was in a place that opposed who he was, would change him into what he was not. Neither praise nor attack moved Daniel. 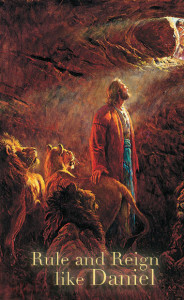 “God is my judge” for Daniel meant that only God was His source, life, knowledge, and existence. God alone. For Daniel, God would name and determine all things, down in a very intimate and private relationship with the man.